Performances by Third Coast Percussion are interspersed with teaching moments that introduce the building blocks of music (rhythm, melody, and timbre) through active participation in a series of interactive activities including clapping, singing, and a listening game. Students learn about the extraordinary range of percussion instruments that can be found in cultures around the world, as well as in their own kitchen cabinets. Think Outside the Drum is ideal for audiences ranging in age from pre-school to 6th Alternative versions of the program are suited for 7thgrade to 12th grade students. The program is also well suited for all-ages family audiences. Any size audience can be accommodated. Click here to download more information and complete technical requirements for this program. Over a 3-5 day residency, TCP performs for the students, introduces three building blocks of music (melody, rhythm, and musical textures), leads the students in breakout sessions where all students create their own melodies, rhythms, and textures, then TCP leads the full ensemble of students in assembling the musical building blocks into a final piece. This project was designed to give young students a creative outlet at a time when their instruction is primarily focused on learning their instrument and learning to perform music written by other people. A projector and screen are required for all workshop days and for the performance. This project is ideal for students with some musical background, but students do not have to read standard Western musical notation. The project works with groups of between 30-40 students who are eager to write their first piece of music. Assistance and supervision by the students’ regular music teacher or other adult supervisor will help insure the success of the project. Students learn about the scientific and musical properties of sound waves (amplitude/dynamics, frequency/pitch, etc.) by participating in interactive activities using app-based technology to visualize learning objectives. All students participate in an interactive musical performance with members of TCP, reinforcing the learning objectives on percussion instruments custom-designed for this project. WAVES is designed for 3rd-6th grade students (9 years old to 12 years old). Ideal audience size is between 60-150. Audiences may not exceed 150. Two performances can take place in one day, or possibly more upon request. No prior musical experience is necessary for students to participate in the musical performance of WAVES. 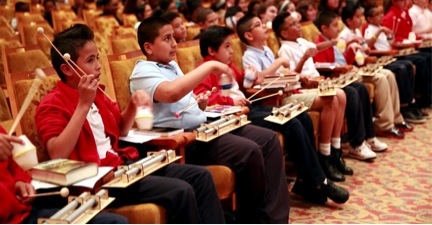 One teacher or volunteer is needed for every 15 students, to supervise and assist in passing out percussion instruments to students in a safe and expedient manner. Video projection required, minimum 2-hour load in before first performance. Read more about WAVES and TCP’s other STEM to STEAM initiatives – click here.